Through their investments, financial institutions play a major role in society and the economy. This means they have a particular responsibility for the impacts of their investments on society. Therefore, the Dutch government has an important role to play in regulating and monitoring the financial sector. The financial crisis demonstrated how devastating these impacts can be. Governments were forced to make extensive interventions to shore up financial systems. In addition to sector-led sustainability initiatives, the government should monitor and regulate the financial industry to ensure that it serves the real economy and contributes to a sustainable society. 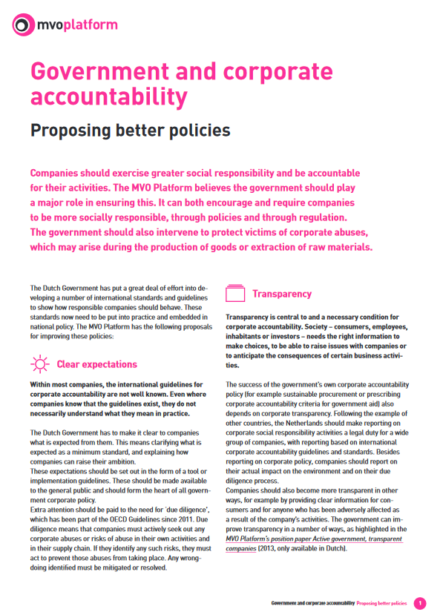 A specific government policy for Corporate Accountability in the financial sector is urgently needed. Where the government has become the co-owner of particular financial institutions through state aid, it has an extra level of responsibility. Government involvement can be used to introduce strong Corporate Accountability policies and to lead the way for others in the sector.